Blessed with a warm Mediterranean climate, fascinating history and stunning coastline, Malta and Gozo are the perfect destinations to explore on foot. We can look forward to discovering these islands in more depth on this two centre walking holiday. Read more about why you should visit Malta here! Day 1-4 Gozo. On arrival into Malta, we take the short 30 minute ferry ride from Malta to the small island of Gozo. It is a tranquil haven, a greener and more rural island to Malta with many panoramic views along its dramatic coastline. Gozo is an island steeped in legend, it is thought to be the place where Greek Warrior Ulysses met the goddess queen Calypso in Homer’s Odyessy. Our hotel for the first 3 nights is based in Marsalforn, the most popular resort on the island, and it has a small pebble and sand beach and promenade flanked by a number of bars and restaurants which are popular with visitors and locals alike! Day 4-8 Malta. Malta is our next destination, often described as an open-air museum where scenery, history and architecture provide a jaw dropping back drop for our walks. We can retrace the footsteps of the Knights of St John, Phoenicians, Romans and the British! Our hotel is located on the Qawra peninsula, within a few minutes’ walk from a 2.5km stretch of promenade which is home to many shops, bars and restaurants. Enjoy countryside views as we walk along the Dwejra Lines, a section of the Victoria Lines. These are a complex network of 19th century linear fortifications. Learn about the history of Our Lady of Itria Chapel and the legendary beginnings of Tal-Isperanza chapel. The walk passes through the quaint streets of Mosta village. Admire the magnificent Mosta Dome and the upward spiralling pattern of the dome interior. Passing through Mgarr, Bingemma, Dwerja Lines, Speranza Valley and Mosta including the Mosta dome. Relish the breath taking views of bays, cliffs, and vast horizons as well as idyllic Gozo channel including the islands of Comino and Gozo. Natural habitats, geological formations and spectacular shades of marine-blues and leafy greens serve as a middle space where land and sea interact; at times in serene harmony and at times in violent conflict. The walk tails through parcels of farmland, wooded area, garigue and beaches. The path also brings forward remnants and reminders of Malta’s military legacy and its bitter struggle for survival as several fortified defensive structures are encountered enroute. Passing through Ghadira, Marfa Ridge, Ponta ta’ L-Ahrax, Dahlet ix-Xmajjar, Ir-Ramla Tat-Torrie, Armier Bay, Marfa, Paradise Bay, Ras Il-Qammiegh and the Red Tower. During the Ramla Country walk you will discover several beautiful historical sites as well as fertile valleys which make the Ramla walk unique. The Ramla Country Walk both starts and ends in Nadur heading to Wied Bingemma you will find a valley where you can watch the local farmers using traditional farming methods. As you keep walking you will arrive to an area called Ta’ Venuta where you can enjoy spectacular valley views. It was here that the French troops landed in Gozo back in 1798. As you continue the Ramla Country Walk you will finally arrive to the large and beautiful Ramla Bay. Then head up to Calypso Cave and onto Nuffara Ridge before heading back to Nadur. Walking along the route we will discover how the island’s rich history, traditions and geographical features intertwine with nature and local folklore. 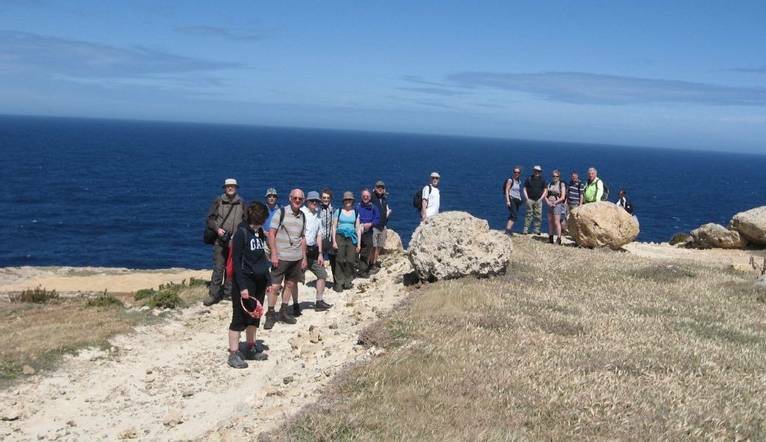 Hiking on the cliffs we can observe the rugged coastline of the Maltese Islands, where panoramic views show how secluded valleys are found amongst the hills. Old farming methods are gradually being replaced by modern farming. Passing through the village of Gharb, Wied il-Mielah, Ghasri Vally, Ta’ Gurdan and Ta’ Pinu village and the Basilica of Ta’ Pinu Sanctuary. One of the best holidays I have been on. An amazing group of people, a great Tour Leader and very good local guide. This was my first holiday in over 10 years and the first on my own...so, nervous at meeting and mixing with the other 20 in the group. That soon disappeared and we all had a fantastic time, with the wonderful Tour leader who was never tiring, always on the go and organising the whole week superbly. Would I book again...definitely! This hotel commands fantastic views of the bay of Marsalforn and is based close to the small fishing harbour, but with plenty of shops and restaurants close by, there’s plenty to see and do within walking distance. Look out for the local fishermen mending their nets! The hotel has 3 restaurants and a bar, as well as a wonderful rooftop sun and pool terrace, where you can soak up some rays, as we enjoy the views out over the bay and the slowly changing seascape. All the rooms feature en-suite bathrooms, air conditioning, ceiling fans, a balcony or terrace, television, mini-bar and safety deposit box (extra charge). Facilities include 2 swimming pool, an indoor swimming pool and access to a fitness centre at the sister hotel 150m away, 7 restaurants and 2 bars. All our rooms feature air-conditioning/heating, satellite TV, safe, tea/coffee making facilities, Free Wi-Fi and a balcony or terrace. The transfer time from Luqa (Malta) Airport to our hotel takes approximately 2 hours, depending on weather and traffic. This transfer includes a short ferry ride (included). Five guided walks are included in the programme. Your walking guide will advise you in resort of the daily programme. The walking programme is graded as Easy to Medium and you can expect to walk between 10 to 12km per day, with some ascents/descents, rough underfoot terrain and high altitudes involved. We suggest a Group Collection to cover transfer drivers, and hotel staff of €20.00 per person. Your Tour Leader will collect this on your behalf and distribute it accordingly, thus relieving you of the burden of who, when and how much to tip. The tipping of housekeeping will be left to your individual discretion (a small amount left in your room on departure should cover this and would be much appreciated). As is customary, ‘the hat’ will be passed around for the driver and guide on all optional excursions. For any meals that are not included in your itinerary, or taxi fares, your Tour Leader can advise of an appropriate percentage on.